I’m trying to be more experimental with my photography. Here’s a technique I haven’t quite mastered, but I actually love the weird blurry results I’ve gotten so far. Bokeh is the “way the lens renders out of focus points of light“. 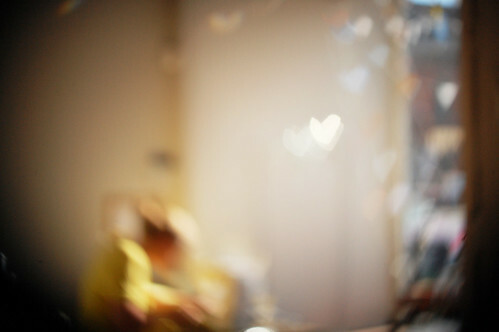 I had seen a tutorial on how to make different shaped bokeh and finally decided to try it out with a heart shape. I think this would work much better using a lens with a bigger aperture than the one I currently have. I’m having lots of fun playing around with it though. One of these days, I hope to get something more like this with my heart bokeh photos. So pretty! I’m also thinking about a new lens for my camera… 50mm 1.8 or a 35mm 2.0. I would also love to have a macro lens. What lenses are you using and loving? i bought my nikkor 35mm 1.8 about 6 months ago and love it. it’s been permanently attached since i’ve bought it. i’ll bring it by sometime if you want to see how it looks and feels. I do not have a funky, cool digital LSR like you (I want one though) so I’m no help there! I just wanted to say thank you for offering The Workroom to us (Toronto Modern Quilt Guild) for our meetings! I had a nice time yesterday and I think it’s going to be fun to have the meetings at the store. You should definitely think about joining us for some of the meetings if you can! Oh, also, I asked you about the cross-stitch pendants yesterday, but then completely forgot to ask you if you would be getting anymore in. Will you? i love it too! it looks dreamy and magical with the blurryness! yay for bokeh! i attempted to make one but need to do a few adjustments! can’t wait until mine works! i was using my 50 mm manual focus but am now appreciating the stock lens my camera came with! i would really love to have a macro lens! For the money, the 50mm 1.8 prime seems to be so worth it. I (sadly) haven’t bought it yet, but my coworker did and he loves it. Where it really excels is is low-light. Definitely my next purchase… one day! Ooooh! A 50mm 1.8 is the only lens I’ve got so far and I’m loving it! Great in low light. oooh this is great karyn! Thanks for this post Karyn; it’s a neat idea! I don’t think my lenses are going to work though, but I might give it a try anyway. I have a Tamron 90mm macro which was less expensive but still works well. I recommend it as an alternative to a Nikon or Canon lens which is more pricey. I’m really enjoying your photo posts; they’re great! So pretty! It’s such a lovely technique. Good work!